Many are the objects exhibited, just like many were the things that fascinated us when we were little kids. They used to take us back in time to the nice stories we were told and to the healthy habits of our granfathers. These habits had only one purpose: the surviving of the whole family. How can we explain now that to have a simple piece of bread a hard work, sacrifices and fears were needed? Working in the fields, sowing, harvesting threshing, beating, drying, grinding, and in the end, kitchen working where part of the everyday life. 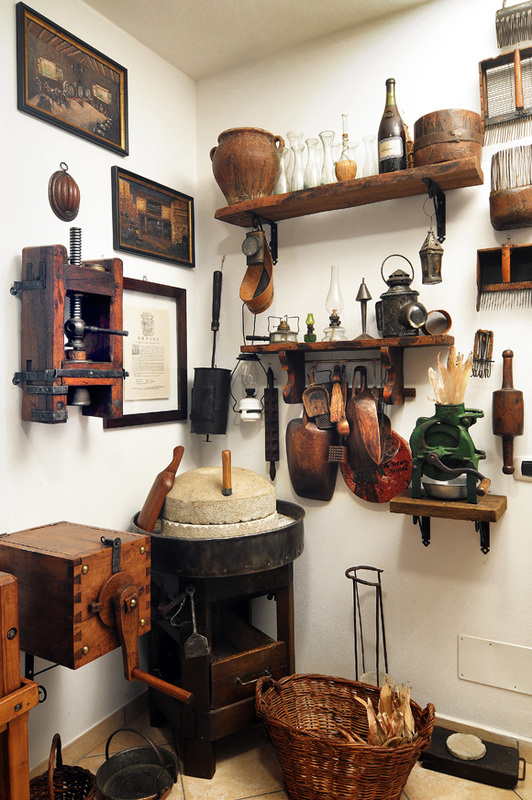 You can see all the objects needed in the past in the permanent exhibition of Boni’s Acetaia. Nowadays, how could we explain to a child that a common sheet could only come out from able hands of women rich of wisdom after a whole winter of working at the loom? But first hemp, linen and cotton had to be sown, harvested, and processed. Also to have a pair of woolen socks, sheeps had to be breeded first and then shaved to obtain wool. So women could work wool to make skein and to make socks in the end. And so on for all the linen of the house and people. The importance of mice’s traps that could save entire families from death of hunger in now impossible to imagine! Every kind of food, fruits, vegetables and cereals had its own world rich of objects, all smart and practical made with rich and poetic manufacture. The joy of collecting all these things makes us ask ourselves the same questions as before. How could we explain this going back to the past so that lost things could live again? In the age of “use and throw” it is not easy to explain the importance of a copper pot repaired many times centuries ago and essential for cooking and for many families’ surviving through the generations. The comprehension of its worth and importance don’t belong to these days. Tigelle, used in ancient times to cook crescentine, (dough made with flour, salt and water) were essential for our ancestors in the countries and mountains to survive during the hard work in the fields. Sometimes that was their only food they had. And these tigelle too had their special equipment. You will see a big collection of the very rare and antique handmade wooden moulds to make them out of special soil found only up in the mountains. 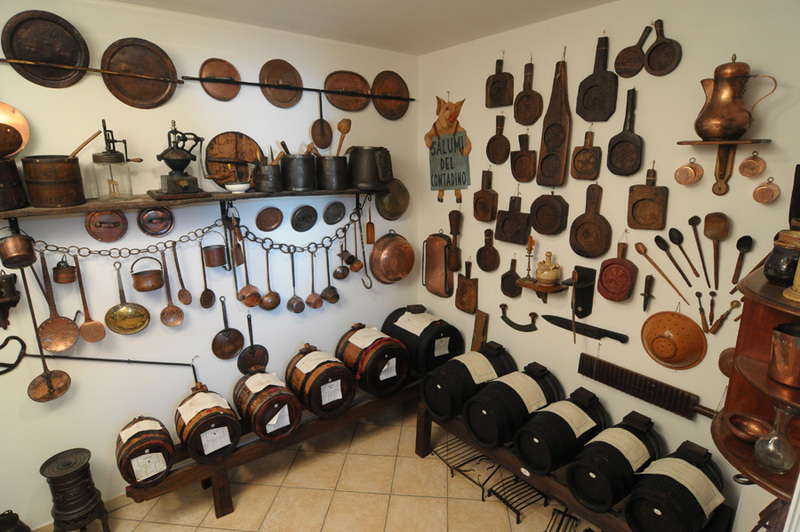 Also the wooden containers used to arrange tigelle in piles after they were heated in the chimney to cook crescentine. Other objects exhibited show life in the fields, art of cooking, the sleeping room and the cantina. Everything had its history and its meaning. Breeding animals, protect themselves from cold winters, light the house, harvest and preserve fruit and cereals, limit the fields, cooking and eating, sleeping, weave, measure and weight, grape harvest, distil, and in the end, produce wine and vinegar. 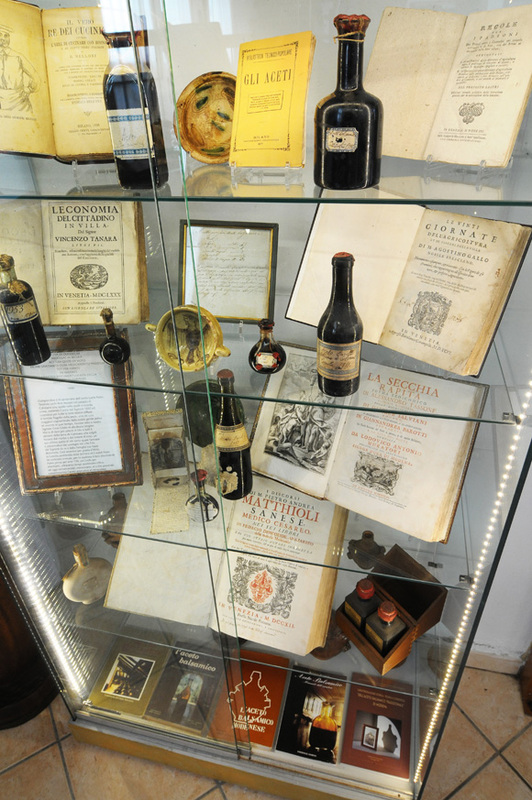 This is the decorum which surrounds our Acetaia. Barrels, small and big, run one after the other, filling up the room. Many creatures that need love and care just like people. The big “mother barrels”, that are named after our grandmothers, nourish the little ones just like a mother would feed her children. This special room is filled with silence that seems to remind us that patience is the essential talent needed for taking care of our vinegar. Modena dark and foggy winters require a lot of our work from us and a lot of rest from barrels. We let the cold fog come in, from doors and windows, just as our favourite host. The walls will become dark and the barrels wet….thanks to this the miracle happens. The very hot summer will be the engine that primes the hard work inside the barrels. Yeasts and acetobacters will fight one against each other until the romantic and red fall lights as a fire the vineyards and reminds that everything has to go back to sleep in the tender and cold arms of the winter. Just like men’s hearts, the barrels will hold inside the warmth of the summer until autumn’s end. A perfect balance reigns inside that black liquid that, despites scientific progress, still holds many and many secrets for us.